Aspirants who are searching for the SBI Clerk Syllabus they can get it here. We have given the Complete State Bank of India Clerk Syllabus and Exam Pattern for the Applicants who are preparing for the SBI Exam. Check this SBI Syllabus and SBI Clerk Exam Pattern to get a good score in the Exam. Candidates can also download SBI Bank Exam Clerk Syllabus Pdf along with Test Pattern through direct link given below. Applicants can check other details regarding the SBI Clerk Syllabus and Exam Pattern at the Official Website. The State Bank of India was going to release the recruitment to fill nearly 8,653 vacancies of Clerk Posts. Job hunters who are hunting for the Latest Bank job in India they can start your preparation. We have mentioned the complete details regarding SBI Clerk Notification 2019. A huge number of people Waiting for these jobs. Application available dates update soon on our site. Applied candidates can download the SBI Syllabus & Exam Pattern of Clerk Preliminary & Mains from this page. Organization Name: State Bank of India (SBI). Post Names: Clerk/ Junior Associate Posts. No of Vacancies: 8653 Posts. Last date for Registration: 3rd May 2019. The State Bank Of India conducts the SBI Prelims & Mains examination for selecting the Candidates. State Bank of India this year updated the SBI Clerk Exam Pattern. So, the applicants can refer the Latest SBI Test Structure. By checking SBI Exam Structure, you will get complete idea about the scheme of examination. You may also visit the Official notification for the detailed SBI Clerk Prelims & Mains Exam Pattern 2019. Here, we have given the SBI Clerk Prelims and Mains Exam Syllabus are here. 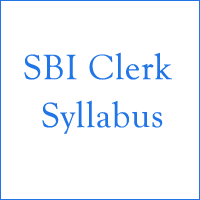 Also, Download Subject wise SBI Clerk Syllabus Pdf from this article. You can also check the State Bank of India Clerk Preliminary and Main Exam Syllabus here. You can download SBI Clerk Prelims & Mains Syllabus 2019. Very helpful for me also.